Forest Oil held its analyst day today and gave an update on its Haynesville/Bossier activities. As with most other natural gas independents, Forest has chosen to focus its efforts on a few key plays, one of which is the Haynesville. 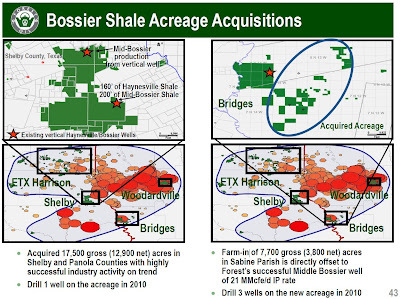 The company now has 103,000 gross (72,000 net) Haynesville acres after acquiring leases on 17,500 gross (12,900 net) acres in Shelby and Panola Counties, TX and acquiring a farm-in on 7,700 gross (3,800 net) acres in Sabine Parish, LA. The land in Sabine is near a Middle Bossier well for which the company claims a 24 hour peak IP rate of 21 MMcf/day. I'm guessing this is the Black Stone Minerals LP 26 H #2 well (#240599; Converse Field, Sabine Parish, S26/T14/R8), but I might be wrong. That's a pretty strong well for the Mid-Bossier and is in line with two of the wells EnCana announced yesterday. Forest plans to complete 15 Haynesville/Bossier wells in 2010 and operate three rigs in the play, two in Louisiana and one in Texas. Along with the Mid-Bossier well noted above, the company referenced (but did not name) another well with a 20 MMcf/day 24 hour peak IP rate. 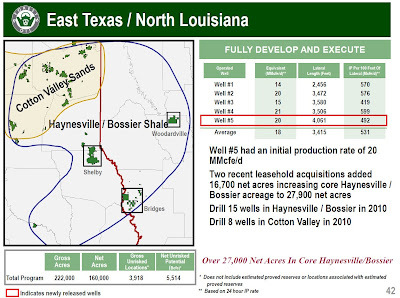 Forest has not been very active in the Haynesville Play to date, but its results in 2010 should shed some additional light on the viability of the southern part of the play, especially in Sabine Parish, and the Mid-Bossier Shale.